In its first incarnation, HOPE House (as HOPE Network was then called) was a home for single mothers. Quickly, it became apparent that a network could serve more women more efficiently than a single household, and HOPE Network was born. The subsequent years tell a story of evolution. Initially, HOPE Network focused on pregnancy and the first year of life. Beginning in 1984, HOPE Network accepted and distributed used cribs to low-income single mothers. As concerns about product recalls and SIDS increased, however, the program evolved. Today, single mothers receive safe sleep education along with a new, portable crib, fitted crib sheet and wearable blanket to ensure they have the knowledge and resources to provide a safe home environment. Community partners are often engaged to ensure that our resources are able to reach single mothers throughout metro-Milwaukee. More than 2,500 infants have received a safe place to sleep from HOPE Network over the years. Read more about our crib program. The newborn stage, of course, is only the beginning of the parenting journey. Accordingly, HOPE Network’s programs accompany mothers throughout their child-rearing years. Of course, this partnership has also evolved over time. In the 1980s and ‘90s, “The Forum” brought together single mothers monthly for discussion, networking and speakers. This group aimed to build community among local single mothers. Mothers also had the opportunity to come together at other events - annual potluck dinners, holiday parties, and clothing exchanges. [historic photos of Mother’s Day potluck] As HOPE’s geographic reach increased, however, so did the challenge of serving the entire metro area. 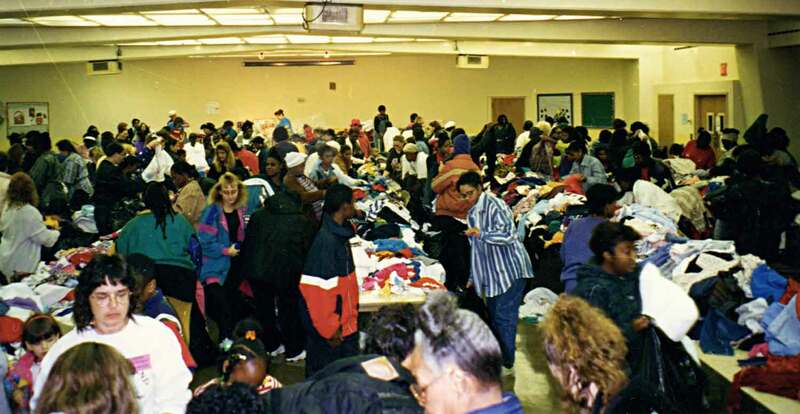 Beginning in the 2000s, HOPE Network partnered with local organizations, including Second Saturday to provide a central gathering place. Now, instead of hosting, HOPE establishes partnerships with community members who can provide enrichment to member families. With HOPE Network membership, single mothers can enjoy family experiences that might otherwise be out of reach - Brewers and Bucks games, museum passes, festival tickets, and more. Members continue to connect with one another through these events and through social media. Resources, of course, remain a struggle for single mothers long after infancy. It’s no secret that kids grow fast. Chubby baby arms and legs transform overnight into lanky teenage limbs. Kids are hard on their clothes, too. Grass stains, snags, and tears are childhood hallmarks - if kids don’t outgrow new clothes before they have a chance to wear them. Infant supplies, too, are short-lived...lifesavers in one phase, dust gatherers the next. Single mothers, more than anyone, feel those growing pains. HOPE Network long ago recognized the opportunity for members to swap kids’ clothes, sponsoring semi-annual clothing swaps among members. Over time, community members began to donate their gently used items to single mothers as well. Hundreds of children’s clothes, toys, and baby items come through our doors every month to be sorted and distributed at our Single Mothers Trading Post. Cosponsored by Ascension Lutheran Church, our volunteer-run Trading Post welcomes approximately 60 families each month. Visitors can pass along an outgrown item (or a canned good to the adjacent food pantry) and select a bag of donated items for their own families. As donations allow, the Trading Post also hosts the occasional special event - distributing school supplies or Mother’s Day gifts to families who attend. The HOPE Network News has filled an important gap since 1984, helping single mothers find additional resources and community. First published as a photocopied newsletter, this print news magazine now runs 28 pages with circulation exceeding 17,000. The comprehensive resource listings are rigorously researched, and copies are requested not only by single mothers but by the agencies who serve them. There’s truly nothing else like it. In 1988, HOPE Network pioneered another powerful tool to empower single mothers - scholarships. Addressing the unique challenge of affordable childcare, HOPE Network’s scholarships may be used for either tuition or for childcare while the mother attends school. This program, too, has grown over time. The first two scholarship winners each received $1,000. [photo of news with first winners]. Thanks to our committed supporters, the program has grown to include more winners, repeat winners, and larger amounts. What does that mean? More women are completing their education, building family-supporting careers, and setting an example for their own children. The world has changed since 1982 - innovations have led to unforeseen transformations, good and bad. What hasn’t changed, sadly, is need. Single mothers remain among the most overlooked and least supported groups in our community. They still confront the unique challenges of raising a child alone. They still want to provide the best possible future for themselves and their children. They still need support. And they still find it at HOPE Network.